"Innovative Corporate Performance Management: Five Key Principles to Accelerate Results" is written by the author of "Five Key Principles of Corporate Performance Management", which is the #1, bestselling CPM for several years running. This dynamic sequel offers insights from business leaders who have won the most globally recognized awards in business. What do award-winning companies know about innovative corporate performance management (CPM) that eludes most of today's executives? How do they organize and conduct themselves to achieve outsized results during the worst recession ever? Learn the secrets to executing strategy effectively in Bob Paladino's "Innovative Corporate Performance Management". 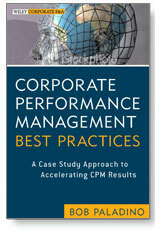 The case companies in this book have amassed over 175 prestigious awards and share over 160 CPM best practices. It's time to add your company's name to the list. "Bob has a wealth of knowledge and experience that he shares, both personally and professionally through his books. We have just begun implementing his five principles of corporate performance management and already our results have been outstanding. Bob's approach and methodology work in all types of organizations and situations. His approach focuses on getting results and improving organizational performance. In a relatively short period of time, we have experienced both." "This book further expands the Strategy Focused Organization/Balanced Scorecard (SFO/BSC) methodologies of systematically operating and strategically growing an organization by utilizing a comprehensive Corporate Performance Management (CPM) process to continuously innovate any given business platform. The CPM process is "scientific" yet elevates strategy and results to a naturally evolving and innovative state. Earlier in his career, I hired Bob as a consultant to help implement the SFO/BSC approach at Crown Castle International (NYSE:CCI) and have continued to utilize Bob's considerable skills in two other business platforms (M7 Aerospace and Intercomp Global Services) which are both multinational companies. His insight and direction have been invaluable." "Paladino offers practical insights, drawn from best-practice examples, on how a CPM office helps organizations successfully execute their strategies." "What I find most fascinating regarding Bob Paladino's work is his ability to transcend both the public and private sectors. His vast knowledge of both for-profit and non-profit organizations enables him to find those best practices that work in both. His latest book is laced with so many gems the book needs a dedicated space on every CEO's desk!" "Companies that can successfully manage change will succeed and prosper. As a business leader, I am keenly interested in tools that help mitigate risk of strategic execution. By providing the pragmatic insights from his case studies and the abundance of best practices, Bob once again gives business leaders that tool to both manage execution risk and accelerate improved results." "An excellent extrapolation of the Kaplan & Norton strategy management framework. The case studies are the jewels that provide the secret to success." Co-Inventor Of the Strategy Focused Organization & Balanced Scorecard, Founder & Director, Palladium Group, Inc.
"As the economy recovers from the Great Recession, the 'new normal' business environment requires that executive management rethink their organization's business model and how it will produce high performance results. Drawing on his vast practical experience and case studies of award-winning companies, Bob Paladino provides new insights on his key principles of corporate performance management (CPM) that have produced differentiating results. This is a must-read for any executive management team striving for high performance in the 'new normal' global economy." Are you ready to step up your business? You can buy "Innovative Corporate Performance Management" on Amazon today!